I won the lottery! The Broadway lottery of course – Straight from NY to Paradise in a Day!!! Ultimately the one aspect of New York that I will always love is Broadway. In every Broadway show, I am always amazed by the creativity and intellectual genius that goes into writing a play, then turning it into a major Broadway production. I only wish that one day I can have half as much of that creativity. During this trip into the city I had the opportunity to go with my mother to see The Book of Mormon, which is a new musical that won 9 Tony awards. I must say that it was quite an interesting masterpiece. Different from your usual musical due to the large amount of profanity. Yet, the provocative nature is what makes this production eye-catching, and attention grabbing from start to finish. I would say that this is a musical that is a must see, as long as you are not overly sensitive to religious issues or offended by the use of constant profanity. 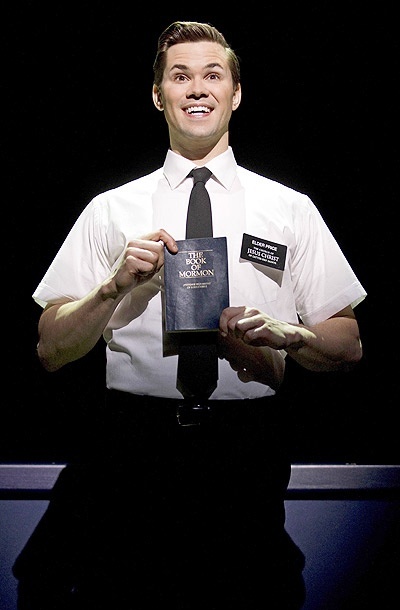 Here is the good part of this city visit: To get a ticket to the The Book of Mormon is no easy task. Nearly impossible would be an understatement. I attempted to order tickets online for my mother and I before I left Hawaii. Unfortunately they were all sold out. Not thinking, I did not realize that this play would be sold out. Next, I figured I would try again to get tickets while in New York. Nope it was a no go. I called the box office, no luck. The nice woman on the phone did offer me 400 dollar premium seat tickets however. My thought was “are you kidding me?” My last name is not Trump! I politely said “no thank you” and hung up the phone. One part of my brain had completely given up on ever going to see The Book of Mormon this year. My thoughts were to try to get tickets for next year sometime, maybe by then everyone who wanted to see this show would have seen it, and I can just order a ticket for my mother and I online. A part of me felt disappointment, and I felt disappointed for my mom because I told her that we can go see this show. My next thought, hey let’s try a last-ditch effort and attempt to win tickets in the Broadway lottery. Now if you know me, or if you don’t, let me tell you, I DO NOT have good luck. Actually I never win anything. I have really crappy luck. Life does not happen to me based on luck, it never has, and I never expect it to. So to enter this lottery for these tickets and win, in my mind I had a better chance of being struck by lighting. Since my mom was also there to enter her name in the lottery, I figured she would probably win. Actually I was expecting her to win. I just had a feeling that the man would say her name, and we would be watching the show in the front row due to her luck. To enter the drawing for Broadway lottery tickets, just arrive at the show that has a lottery 2 and a half hours in advance of the show time to put your name in the drawing. 2 hours prior to showtime they call out the names for a highly discounted front row ticket. I had tried the lottery once before to see Wicked, unfortunately I did not win then. And I had little hope that I would win now. My mom and I arrived at the theater about 3 hours before show time. People were already waiting in line for standing room only tickets, and another group of people were waiting for lottery tickets. As the time came to hand out the cards, a giant crowd formed in front of the theater, close to if not more than a hundred people. Many people, all for the same purpose, hoping to pay 32 dollars for a front row seat to the hottest musical in town. 2 hours before the show, the man started to call out the names of the winners, all the while I was thinking I hope I win, but I am not really sure I will win. My mom had already thought of our back up plan when we did not get the tickets to the show. We would go to the museum and on the NY sightseeing bus. I still had a little hope but as the first 6 sets of tickets were given out and my name not called, my hope was quickly dwindling. My next thought was would this guy hurry up and call out these names so I could go eat lunch. I was starving. At least a sandwich and a Starbucks latte were something I could actually get. As the man said that this is the last set of available front row tickets, he then called out my name. ME he called. It replays in my head in slow motion. I heard my name. Never have I been so excited to hear my full name. With shock and amazement I could not believe it was real. I had won something, and I had won something that I had actually wanted. My mom was so happy to hear my name she screamed louder than a parent at a graduation ceremony. She may have screamed loud enough for all of midtown to hear. You would have thought I won the real lottery. It was nice to see her happy. She deserves happiness. Excited about my win, my mom and I were able to sit in the very front row of The Book of Mormon for only 32 dollars for each ticket. A ticket that the woman on the phone tried to sell to me for 400 dollars the day before. Wow, look at the way life works. Unpredictable. Just live. As my mother said “we sat so close the actors could spit on you”. Gross I know, but you could see the spit coming out of their mouths as they spoke. Great times, another great day in New York. Truly revealing appreciate it, I think your trusty readers could possibly want a whole lot more writing like that carry on the good hard work. what the f?! the book of mormon seriously?! what was it about?! Yup seriously! It is a satire on how Mormon missionaries attempt to convert Africans to the Mormon religion. It is a completely funny musical, nothing serious about it at all, but great entertainment if you are in NYC. haha effing mormons…to be honest i was and please note WAS a mormon. now that i’m at a safe distance, i can see how stupid i was for even joining in to the craziness haha! Ha ha! Then you would defiantly appreciate this musical!